you need to take your songs from good to great. Reason has a rack for mixing. Reason comes with all the tools you need to give your tracks that big studio sound right out of your computer. Walk into any recording studio and the large format mixer is the creative centerpiece of the production environment. Reason is no different. A musical tool in itself, the mixer is where you bring all the elements of your production together and shape them for your final release. Faithfully modeled after the famous SSL 9000k* analog mixing desk, Reason's mixer comes complete with flexible routing, full dynamics, EQ, advanced effects handling, full automation, groups and parallel channels, and the famous master-bus compression. The spectrum analyzer window with visual EQ control makes it easy to fine-tune the sound of your tracks from anywhere in the program. The mixing console features a warm sounding EQ section with high and low pass filters, high and low shelving filters as well as parametric midrange filters. This is where you can take out the rumble in the guitars, give your vocals more air or just add some extra polish to your recordings. How does it sound? Fabulous. 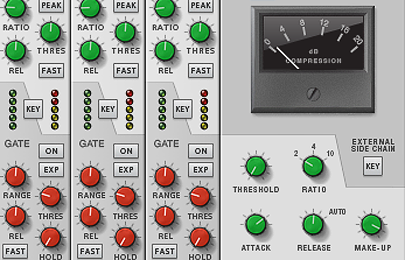 Every channel has its own fully featured dynamics section with compressor, gate and expander. Use it to tame wild sounds, liven up lifeless recordings, or sidechain it to get that pumping sound. The console has eight dedicated effect sends. Each send can be set to work pre or post fader. Adding a send effect to the mixer is a two mouseclick affair. 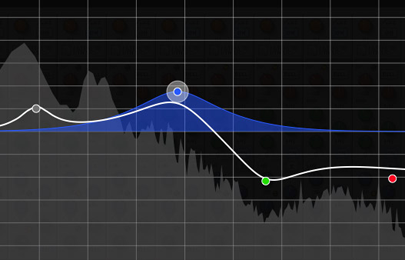 Simply right-click in the mixer's master section and select what effect you want to use. Reverb? Delay? A Combinator effect patch? All of the above? Simple! When you have several tracks that you want to process together, like a multitrack drum recording, or a big layered synth lead, Reason's mixer bus channels come to the rescue. Group channels give you access to the same processing tools as on individual channels, including sends and inserts, and make it easy to balance the levels of all your instruments. Create parallel channels with a single click for separate processing—for quick New York-style parallel compression and other tricks used by leading mix engineers today. For increased control of your mixes Reason has a built‑in spectrum analyzer window, giving you instant visual feedback on the selected channel or group—or your final mix. The Spectrum EQ window combines a powerful spectrum analyzer with a graphic EQ overlay controlling the mixer’s renowned EQ. Easily adjust the EQ on your tracks from anywhere in the program. Known for its radio-ready sound, the SSL* master bus compressor has long been famous for its ability to glue mixes together and give all tracks a sense of cohesion. It's not about brick wall limiting. It's about warm compression that you've been hearing on mixes for the past 30 years. By applying this analog magic to your master mix bus, your drums will gain punch, your bass more warmth, and your sound more intangible sparkle. Sounds too good to be true? Hearing is believing. We've recreated the sound of this bus compressor to exacting standards, so all you need to do is turn it on.